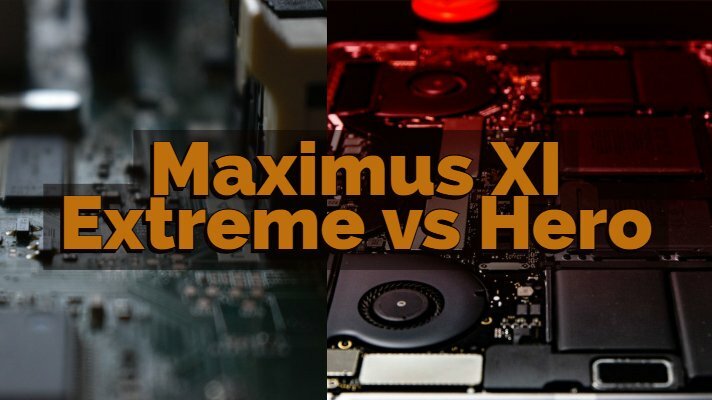 Today we are talking about two of the most potent motherboards in Asus lineup; The Asus ROG Z390 Maximus XI Extreme vs Hero. The Extreme model is yet to hit the market. However, we will be discussing whatever information is available out there, to give you about an idea of what these motherboards are all about and how their performance level differs from each other. We will go through all the relevant specifications and technical details side by side, so our readers get the differences clear right before their eyes. I/O Shield (pre-mounted), ASUS SafeSlot, high-quality components for enhanced durability. As this section implies, there are some similarities and many differences as well in these two motherboards. For example, they both have similar audio technologies, safeguard parameters and cooling specifications, overclocking support, etc. However, there are many differences as well. We will go a little bit deeper into the technical aspect in the following section. 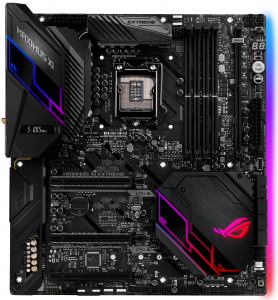 So after getting a quick overview of what these both motherboards, the Asus ROG Z390 Maximus XI Extreme and Hero has to offer, let us dive in a little deep into the technical specifications. Following is a brief specs comparison for both motherboards, categorized in various criteria. Have a look; we hope it will help you to get a complete understanding of the motherboards. As the table implies, the CPU support is nothing different for both the motherboards. They both are based on same architecture and chipset, they both come with the same socket and thus support the same range of Intel 8th and 9th gen CPU families without any restrictions. 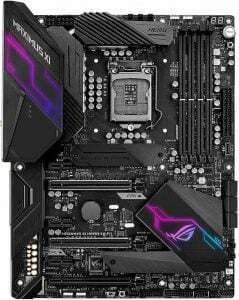 Like the CPU support, the memory configuration for both Asus ROG Z390 Maximum Xi Extreme and Hero are same. They come with four DIMM DDR4 slots supporting up to 64 GB of Non-ECC, the Un-buffered main memory of types specified above. However, the supported memory types may vary based on what type of processor you are going to use in your rig. Moreover, they come with dual channel memory architecture. Which means you will need to install two or more supported memory modules into matching slots so that that memory controller can access each of these. Another great feature is Intel XMP support. The Intel Extreme Memory Profiler allows you to overclock the memory by merely tuning some BIOS settings to enhance your creation and gaming experience. That’s not it, XMP also allows loading and test predefined profiles through different ways. It makes convenient to find the right settings for your system. Both of the motherboards are designed to optimize the integrated graphics processor (if your CPU has any). When we talk about the differences, the Maximus extreme does not support multiple VGA outputs. It has only one HDMI output, delivering 4096 x 2160 maximum resolutions with a 30 Hz refresh rate. On the other hand, Asus ROG Z390 Maximus Hero supports dual VGA output. Addition to HDMI, it also has DisplayPort, which delivers better resolution and refresh rate compared to HDMI, that is 4096 x 2304 at 60 Hz. Both the motherboards come with support to multiple GPU. They support various technologies by Nvidia and AMD to serve the purpose. You can use up to two Nvidia graphics card with the same GPU in both motherboards. AMD gives you some more space as it allows up to 3 graphics card and that too with different GPUs. The audio specifications in both motherboards are some. As you can clearly see in the table above, the expansion support and storage interface is almost similar for both the motherboard. However, note that Hero offers better 6 GB/s SATA slots compared to ASUS ROG Z390 Maximum Extreme which offers only 3 GB/s SATA slots. Moreover, the USB specification and positions are different as well. Talking about the wired connectivity, Extreme offers Aquantia AQC111C 5G LAN controller which Hero has onboard Intel I219V and Gigabit LAN controller as well. We are not sure how much it will impact the networking performance. However, Hero does not feature wireless connectivity nor Bluetooth, which is a big plus for extreme. It is going to save you from investing in separate Bluetooth / wireless cards. You can see in detail wireless connectivity details for ASUS ROG Z390 Maximus XI Extreme is described in the table above. We hope this post helps you to understand the significant differences between Asus ROG Z390 Maximum xi extreme and hero. If there is any doubt or suggestion on your mind, feel free to contact us directly or comment down below. Make sure you subscribe Face of IT for regular tech updates. See you until next post, Thank You.